Emma Pickett is just the person to write a book for confused or anxious or curious teenage girls. She has an abundant and fascinating knowledge of the subject, and a humorous, patient tone with which to impart it. What makes this book particularly special is the deep feminism that comes through on every page: your body is normal, your body is good, your body is your own for you to make decisions about. 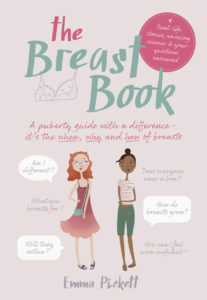 The Breast Book covers how breasts grow, what they are for, and why society gives us such confusing messages about them. Illustrated with cartoons, photos, and anecdotes from women of all ages and one transman, it’s very accessible even for the younger reader. And while the younger reader may not take in all of this detail to start with, just owning this book means they have a reliable resource for when they are ready. It even includes sample notes to highlight in order to start a conversation with parents, should it feel too difficult to do this out loud. And parents, note: this book is not a substitute for talking to your daughter, but is an excellent companion.